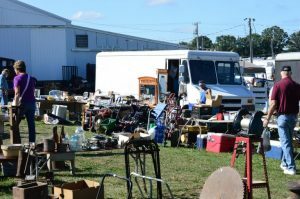 There is always quite a variety of flea market items ranging from household and farm related collectibles to produce to tools for the workshop. 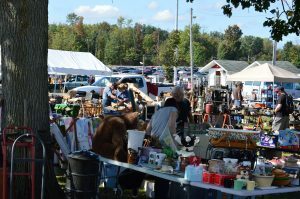 Bring your bag, bring your wagon, and enjoy a day in the flea market area. There really is something for everyone! Rate: $25.00 a space for the weekend. No discounts for 1-day vendors. 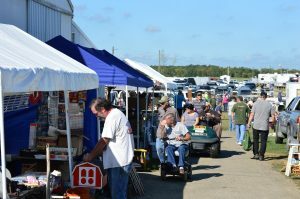 Camping on flea market sites is permitted. Fee is an additional $40.00 for the weekend. Deadlines: For existing vendors prepay by August 9th to retain existing spaces. Current vendors seeking to add extra spaces will need to contact LEC prior to mailing contract back. New vendors: space is limited. You may be put on a waiting list. If this occurs, you will be extended a contract for the following year. This is an engine show with dirt, dust and smoke throughout the grounds. If this is a problem for you or your merchandise please let us know and we will try to move you to a different area. NO walk-in vendors the same day of the Show or setting up without a reservation. Please download contract for complete vendor information. Beginning Wednesday after 5PM if sites are marked & ready for occupancy. Remember, weather conditions that week can delay site marking. Friday through Sunday set-up needs to be completed before or after flea market hours. You may move merchandise via golf cart or hand cart only during show hours. No cars or trucks are to be driven through the market during show hours. This is for the safety of our guest and other vendors. Contact Jane at Fleamarket@lagrangeengineclub.com . After 5PM you may phone 440-342-9682. Please leave name, phone number & brief message. During Set-up and throughout the show you may contact her at this phone number. She will be happy to show you to your site or answer any questions.